The Chief Advisor of the Interim Government, Chief Justice Dasho Tshering Wangchuk, is in Nepal to attend the Fourth Bay of Bengal Initiatives for Multi-Sectoral, Technical and Economic Cooperation (BIMSTEC) Summit. Upon arrival in Kathmandu, the Chief Advisor was received by the Deputy Prime Minister of Nepal, Ishwor Pokhrel, and was presented with a Guard of Honor. Later, Dasho Tshering Wangchuk visited the Bhutanese temple, Deva Dharma Mahavihara in Swayambhunath. 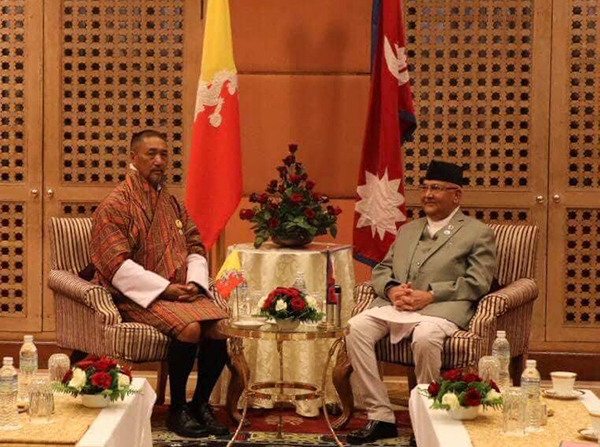 In the afternoon, the Chief Advisor also met with the Prime Minister of Nepal, Khadga Prasad Oli. The Fourth BIMSTEC Summit will be held in Kathmandu, Nepal from August 30-31. BIMSTEC is a regional organisation comprising seven countries of Bhutan, Bangladesh, Myanmar, Nepal, India, Thailand, and Sri Lanka. Bhutan became the member of BIMTSEC in 2004, seven years after the organisation was founded through the Bangkok Declaration in 1997.